Fourth Row Center: Film Writings by Jason Bailey: Saturday Night at the Movies: "Cold Souls"
Here’s a research project for you: find one review of Sophie Barthes’ Cold Souls that doesn’t mention Charlie Kaufman. Good luck! They are, admittedly, pretty easy dots to connect; Barthes’ story, in its broad strokes, mixes the pseudo-celebrity themes of Kaufman’s Being John Malkovich script with the medical/psychological concepts of Eternal Sunshine of the Spotless Mind. But what’s important to note is that Cold Souls is no mere copycat, no proto-Kaufman Things to Do in Denver When You’re Dead; it is a film with its own particular style and ideas, and, at its best, is just as strong as the pictures it is so readily connected to. Paul Giamatti stars as, well, “Paul Giamatti,” a well-known character actor struggling through rehearsals for a New York production of Chekov’s “Uncle Vanya.” Something’s not quite right, he can feel it—something is weighing him down, keeping him from getting the role right, but he’s not sure what. He thinks he finds an answer when his agent tells him to read a New Yorker piece about “The Soul Storage,” a company that removes the soul, allowing people to live their lives more freely and happily. 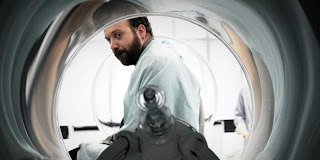 Paul decides that maybe that’s what he needs in order to do the play—a short-term soul transplant. It ends up getting more complicated than that. Giamatti is outstanding in a role that was, obviously, written expressly for him. As a result, it’s (predictably) a “Paul Giamatti type”—exasperated, neurotic, put-upon, but with reserves of hope and longing. The most interesting—and most challenging—aspect of the role is in the performance within the performance; as the actor playing Vanya, he must first be not quite good enough, then very bad, and then very good. He pulls all three off with aplomb (though it is worth nothing that there is a certain Shatner-esque quality to his bad Vanya). Barthes’ direction is subtle and unimposing; she lets her screenplay do most of the work, but that’s as it should be, since this is a story that doesn’t need a lot of visual razzmatazz to come across. The production design is quite clever, particularly in the contrast between the stark, clean, almost Kubrickian New York facility and the rinky-dink, thrown-together version housed in a Russian warehouse. There are a few minor flaws—the picture drags occasionally, and while I’m glad to see Lauren Ambrose getting work, she’s basically wasted in a nothing role. But these are piddling complaints. Cold Souls is a thoughtful, inventive, delightfully clever little movie, and when it softly switches to more serious waters in its third act, the turn is expertly navigated. Seek this one out, post haste. "Cold Souls" is available on DVD and is streaming on Netflix.